Pancakes are already one of the best things to wake up for. Say the words "buttermilk pancakes" and everyone will be rushing to get out of bed. This recipe for buttermilk pancakes is easy and straightforward but the flavor is next level. That's because something magical happens when you add buttermilk to the batter. It activates the baking powder so the pancakes rise up nice and high. Buttermilk also gives the pancakes are more tender crumb. Oh, and then there's the tangy flavor of buttermilk that's so good here. Light, fluffy, and tasty—that's everything you want from pancakes. We especially love to top these pancakes with fresh berries and maple syrup. You'll win extra points if you use real maple syrup and warm it up. The finished pancakes freeze beautifully. Make a double batch and freeze the extras for quick and easy breakfasts for the pancake-loving members of your household. Per Serving: 305 calories; 10g fat; 43.4g carbohydrates; 10g protein; 81mg cholesterol; 1096mg sodium. You will want to throw away your box pancake mix after you try this recipe. 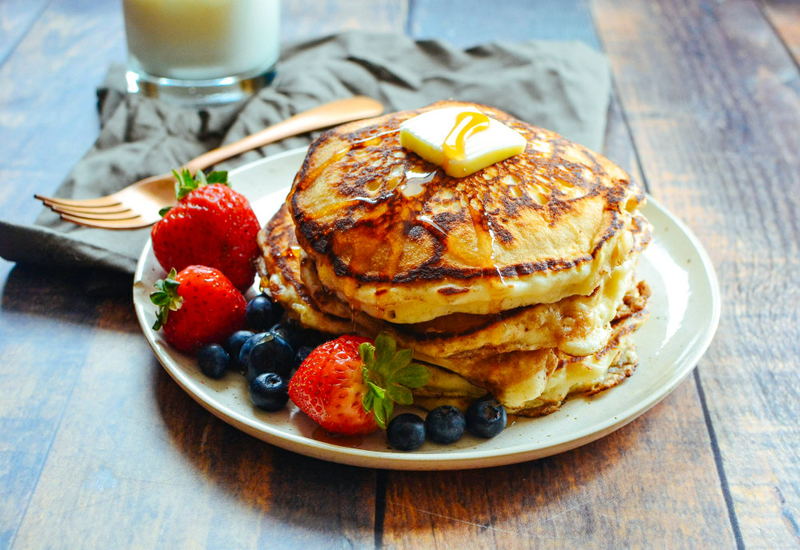 These buttermilk pancakes are so easy to prepare and taste amazing. They're perfectly fluffy, which is sometimes I struggle when making from scratch. What worked for me was to spoon the flour in and then leveling it off so that my measurements were accurate. Simple, delicious, and my go-to recipe for pancakes. Solid pancake recipe. The buttermilk makes a huge difference in the texture. I used two tablespoons sugar instead of three, and was pleased with the way they turned out. I make them every weekend. One of my favorite recipes! I make the really large pancakes and smother them in butter and syrup. Perfect for Saturdays. I also like to add a little vanilla extract. These are like my mama's buttermilk pancakes! I made these on my flat top griddle, they were perfect. I also added cinnamon and vanilla extract. I didn't have buttermilk so I used the milk and lemon concoction that's supposed to make "buttermilk". I think it worked because they turned out really good. Makes enough for me and the kids.